Wonder Lake was designed with a “run-of-the river” dam spillway, where all flow leaving the lake cascades over a concrete spillway with a fixed (non-adjustable) weir. 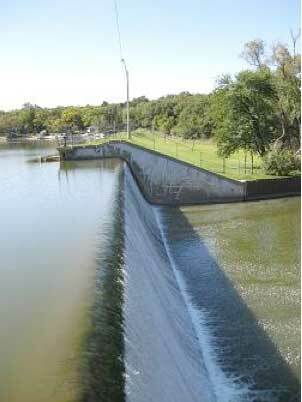 This weir elevation is fixed at 803.0 feet above sea-level. While Wonder Lake does temporarily store floodwaters as the lake level rises when the volume of water flowing into the lake exceeds the volume flowing over the spillway, Wonder Lake was NOT designed as a flood-control facility. The FEMA mapped 100-year floodplain elevation for Wonder Lake is at 808.0 feet above sea-level, meaning that a five-foot rise in the level of Wonder Lake is predicted to occur during a 100-year flood event. The only means of manipulating the water level of Wonder Lake is by operating two submerged sluice gates, built within the dam structure, which can be cranked open to lower the lake level below the dam spillway elevation, or be cranked shut to restore the lake level to spillway elevation. 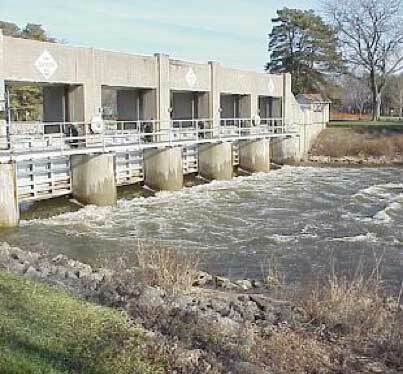 Because of the dam design limitation and liability issues associated with changing downstream flow conditions, it has been a long-standing policy of the MPOA to only operate these sluice gates if there is an emergency need to lower lake levels; when dam or spillway repairs are needed; or to temporarily exercise them during the annual dam inspection. However, it is recognized that lake draw-downs can make lake shoreline cleanup efforts easier, or facilitate repairs to shoreline areas. As a result, the MPOA will strive to provide lakefront landowners with as much advanced notice of any planned lake drawdown as possible, so landowner activities can be planned and coordinated to coincide with the drawdown.